Jonathan Allen’s bible-thumping alter-ego, Tommy Angel, is a character of seductive grotesquerie: a beguiling hybrid of Deep South evangelist preacher, 70s cheese-bag magician, and Sforzian political svengali. A contemporary carpetbagger for American Fundamentalism, Angel manifests in life-size photographic portraits, and the live performances which emerge from their illusory surfaces, drawing connotations between religious faith, secular magic, and art's hall of mirrors. Provocative entertainment, sleazy showmanship, and charlatan trickery blur as Allen interrogates the religious and political unconscious of our time. Tommy Angel #8 is one of a series of images depicting various magic routines or ‘miracles’, each culled from the shared iconographies of Vegas and Christendom. 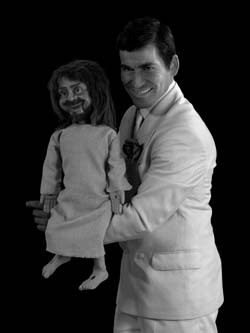 Parodic and downright pervy, Allen’s ventriloquist act with a Charlie McCarthy Jesus plucked straight from the cross is posed as a freakish Madonna and Child.